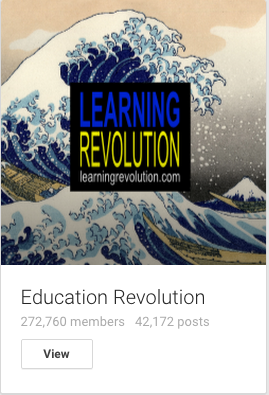 Google+ is full of teachers and school leaders sharing tips, encouragement and resources. We're big fans of these communities and you should be too! Do you have a favorite Google+ community not listed? Comment below and share your favorites. This is a great community for those looking for tips and advice on how and why teaching and learning are redefined in the age of the Internet. A community focused on educational leadership. Principals, superintendents, central office administrators, professors, policymakers, etc. This community serves as a communication hub for teachers, students, and parents to discuss all topics relevant to Education. This is a community for teachers interested in joining in discussions involving best practices, sharing ideas, or just networking with other teachers. This community discusses Edtech, K-12, Higher Ed, English, Math, Science, Social Studies, History, Athletics, Music, Theater, Library Information Science, and anything else about schools. This a community for educators who are using Google Hangouts in their classrooms.